Last week, the NHS announced that they carried out 4,655 transplants last year, a 10% rise on 2012, and over 20 million people are now on the Organ Donor Register. It is good news that organ transplants are on the rise; however, the number of people on waiting lists is still higher than those donating organs. Each year one thousand people die waiting for an organ; therefore, several changes need to be made to increase organ donations. Preventing families overriding a donor's wishes after their death would increase donations in the short-term, reducing potential donor numbers. This refusal deprives people of useful organs, while also refusing to respect a donor’s last wishes. 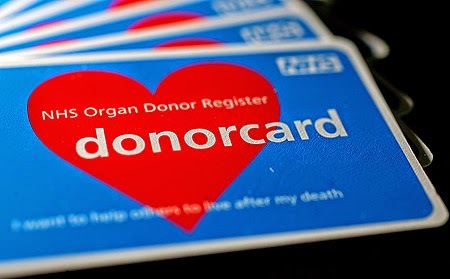 Currently, 10% of families refuse to allow the removal of organs after a donor’s death; an NHS report published last year proposed removing this ability. In the meantime, donors need to talk to their families explaining their decision reducing the possibility of withdrawing consent after death. The NHS also proposed moving people up the transplant waiting list if they were on the Organ Donor Register. Clearly, this would be very unfair, penalising people unaware of the register. According to a survey by UK Transplant, 90% of people in the UK support organ donation, but only 30% of people are registered donors. The UK government needs to look at introducing an opt-out system of organ donation to increase this number. In an opt-out system, a person's consent is presumed unless they explicitly say otherwise. The Welsh government recently legislated for opt-out donation, due to begin in December 2015. The Welsh government expressed hope that organ donations will increase least 25% with the new system. This would remove a hurdle for people who want to donate their organs and the UK government should monitor the results carefully, with a view to introducing it in England. Many religious leaders expressed concerns about the idea, but it does provide for the ability to prevent organ donations if people explicitly wish. I have a vested interest in this topic; the impact of polycystic kidney disease on by family has resulted in both my dad and auntie having kidney transplants. My family has been lucky; one thousand people die each year while on the transplant waiting list. The need for organs is severe and these proposals will increase transplants. In the short-term, preventing families from overriding a donors wishes would increase donations by 10%. In the long-term, adding thousands of new people to the register through an opt-out system should increase donations by at least a quarter. Although one has sympathy with the current position of those in need of organ donation where no organs are available, an opt-out system is simply not the way forward. This is seen most prominently in the hospital context - doctors would have an automatic right to take a patient’s organs. Although this would increase potential donors and relieve relatives and friends from burden need to make organ decisions at an emotional and traumatic time, it simply causes more problems than it solves. Not everyone will get around to registering their objections or even know that they need to register their objections. This can lead to situations where the forced donnee did not want to donate their organs and the family of the donnee also reject the donation, however the donation is nevertheless forced upon them. This can be extremely traumatic for the family at an already distressing time following the death of a loved one. The loss of control a family will have over the destiny of their departed relative’s body will result in a feeling of distrust and great dislike for the medical professional, as ultimately these will be the persons delivering the unwelcome news and being seen to force the donation upon the family. The medicial profession are likely to receive bad publicity as a result and it may ultimately lead to a lack of trust in the profession – a major disadvantage to society as a whole. Furthermore, under the current system consent is needed from either the donor or the family for a donation. This ensures the donee knows that the organ comes with consent and feels free to accept it. Under an opt-out system, the donnee will not be sure whether the organ came with consent or not, and therefore they may be less likely to accept it as a result. Austria and Spain have tried opt-out systems and saw an increased number of opt-outs than expected. This has been thought to be due to the benevolent incentive to donate – when people see it as a good deed to donate, they are more likely to do so than when they are seemingly being ‘forced’ into it under an opt-out system. Serious issues may arise for the health of the donnee of the organ if the relatives of the donor uncorporative with the donation process – an integral piece of information about the health of the donor/the organ may be missed without the co-operation of the family. It is also the case in the UK that many people are simply not informed on this topic. Silence cannot be taken to imply agreement with the donation policy, as many will simply lack understanding about organ donation and the outcome of failing to make a choice. Finally, it will be most traumatic for families where a relative is declared clinically dead but appears ‘physically alive’ e.g. still breathing. If the family do not consent to donation and they say goodbye to their loved one before they are wheeled away for a ‘live’ organ harvest, this will be extremely traumatic and harrowing – the ultimate example of why an opt-out system should not be applied in the UK. Indeed a number of media outlets have canvassed opinion on opt-out systems amongst those families who gave consent for their loved one’s organs to be donated and they have said that they would not support such a system as they would not have wished to have the decision forced upon them. Indeed, I agree something must be done to increase donation but as one can see an opt-out system is most certainly not the answer. Perhaps you should have considered the mandatory choice system as more appropriate in the UK. I wasn't aware of the mandatory choice option before reading your comment, it is a very interesting possibility, thank you for bringing it to my attention. Thank you for your comment as well, it's very interesting reading an alternative view. Do you have a blog or something similar I can follow?